Social media can make a lot of people feel inadequate after seeing everyone else’s seemingly perfect lives, especially moms. With all of the photos of gourmet meals snapped in a seemingly spotless kitchen with seemingly perfect kids in the background, it’s no wonder that some moms are feeling down. 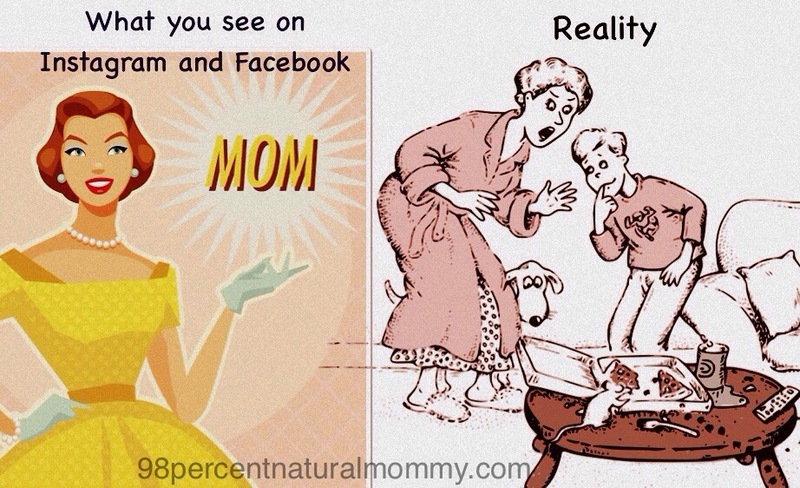 People tend to put their best face forward on Instagram and Facebook, which can be misleading. Those photos may have been taken in the only clean corner of the kitchen after countless mishaps while making dinner. Some moms have nannies and maids to help, while others have no support or help at all. So it’s not fair for a woman who is trying to juggle everything on her own to compare herself to another who makes fantastic pastries while her nanny watches the kids and the maid cleans the house. My point is that no one is perfect, and moms have enough on their plate without worrying about not being able to make elaborate meals like Mary on Facebook or have a clean house all the time like Susan on Instagram. Everyone has their strengths, so instead of feeling depressed about others’ skills remember that they have flaws as well (no matter what their social media accounts portray). Focus on your own strengths and don’t compare yourself to others. If you are genuinely doing your best for your kids then drop the guilt.